Имате въпрос към Doungkamon Mae Sod Hotel? Удобно разположен в Так, Doungkamon Mae Sod Hotel е чудесна стартова точка, от която можете да започнете да проучвате този оживен град. Този 2-звезден хотел е леснодостъпен, тъй като е само на 100.8 km от летището. С удобното си местоположение хотелът предлага лесен достъп до всички градски забележителности, които задължително трябва да се видят. Предлагайки висококачествени услуги и широка гама от удобства, Doungkamon Mae Sod Hotel Ви осигурява възможно най-комфортния престой. Хотелът е оборудван със съоръжения като безплатен WiFi достъп във всички стаи, 24-часова охрана, ежедневно почистване, магазин за смесени стоки, 24-часова рецепция. Дизайнът на хотела е съобразен с най-високите изисквания за удобство и комфорт, осигурявани от съоръжения достъпни в някои стаи като достъп до интернет (безжичен), безжичен интернет достъп (безплатен), стаи за непушачи, климатик, бюро. Възможностите за отдих, които хотелът предлага са масаж, които също предоставят бягство от ежедневието и предразполагат за пълна почивка. С превъзходните си удобства и отличното си местоположение Doungkamon Mae Sod Hotel е идеално място, в което можете да се насладите на престоя си в Так. It is a very large and cheap hotel.The room is very large in price.There are many restaurants near here, but there is no good coffee shop.There is a Thai coffee shop made in Thailandaround here. Only room with AC. very large quit clean balcony. The rooms with fun were smaller and dirty. The hotel is old not very clean but in a good position. Possibility to rent a bike. Staff doesn't speak english only few words. Good location with clean sheet, bath. Some staff can not speak English. Nice location and building. The room looked fine until I got into the bathroom... the sink had a layer of dust and grime on it that looked like it'd been accumulating for a couple months. Other than that it was fine, although it does make you wonder about the cleaning staff because the sheets seemed to be fresh. You get what you pay. But walking distance from most of things in the center. Отседнахме 13 вечер/и в октомври 2015 г. Convenient location. Bicycles available. Great price. I've stayed here twice and thoroughly recommend it. I stayed in the new annex both times which is definitely worth the small surcharge. Well situated. Popular with volunteers. 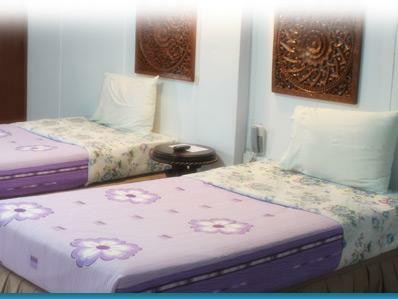 Good location, spacious room (standard room) with a balcony. Cheap bike rental. Our stay was ok. Staff is a bit absent-minded, limited English skills. Good basic hotel. Hotel is center of Mae Sod. It's near market and restaurant, Hotel are bicycle for rent. Terrible hotel with room that has bad odor and mattress was so hard like sleeping on the floor. No elevator so had to haul all my luggage up flights of stairs by myself since nobody in hotel to assist me. Lost all my advance payment since just walked out of the hotel. We booked two nights and stayed three additional nights. We were in Mae Sot in order to jump over to Myawaddy to renew our visas and we decided NOT to travel during the new years holiday. We kind of just liked the small town vibe here. The first 2 nights at DK we stayed in the 'newer' wing which was nice but we found that the main (I guess older) part was better (and cheaper). The rooms were larger and it had a private balcony which wasn't the case in the newer section. We were there for new years eve and our balcony on the third floor was the best seat in the city. The local market which is just a short walk away is absolutely incredible (the one at the border is crap) and there are great wats nearby - so don't believe the guidebooks that say there is nothing to see in Mae Sot. Just start walking. The DK is a great place and there is plenty of great food very close. I will stay here again if I ever find my way back to Mae Sot. Hotel abbastanza pulito e confortevole. Ottima posizione. Avevamo prenotato una stanza tramite Agoda e quando siamo arrivati ci hanno sistemato in una vecchia stanza al terzo piano senza ascensore del vecchio edificio bianco e azzurro che si vede in foto (dove c'è la reception). Abbiamo chiesto se si potesse stare nel nuovo stabile verde e ci hanno detto che la nostra prenotazione Agoda valeva solo per il vecchio stabile ma che avremmo potuto pagare la differenza (70 bath) alla reception e stare nel nuovo stabile. La differenza di soldi è irrisoria e le stanze sono molto migliori nel nuovo edificio (che è a lato del vecchio), più pulite e confortevoli. Non viene servita la colazione ma nel tavolo in ingresso al mattino viene collocato un termos con del caffè. Non male per i soldi spesi (9€ tramite Agoda + 2€ per stare nel nuovo edificio). Posizione centrale! Wifi, fallait sortir de la chambre, aller au bout du couloir... Lol. Es gibt keine besten Dinge! Mir wurde ein Zimmer mit zwei Einzelbetten zugeteilt. Bei Bereitstellung eines Zimmers mit Doppelbett wird ein Zuschlag erhoben. Das angekündigte "Parkhaus" gibt es nicht! Ganz normaler Parkplatz vor dem Hotel, für jedermann benutzbar. Mae Sod ist eines der wärmsten Regionen in Thailand, die Klimaanlage wird vom Hotel eingestellt, man kann sie nicht ändern. Kein Kühlschrank vorhanden, das "freie Wasser" wird "brühwarm" serviert.